Our Academic Faculty consists of the Visiting Professors and Lecturers listed below, as well as the Core Staff of the Institute. Most of our Academic Faculty listed below are accepting applications for PhD students. Please contact the Institute if you are interested in doctoral research. Revd Dr Demetrios Bathrellos is a Visiting Professor and Distance Learning Tutor for the Institute for Orthodox Christian Studies. Father Demetrios received his doctorate in Systematic Theology from Kingís College, London and is the author of The Byzantine Christ: Person, Nature and Will in the Christology of St. Maximus the Confessor (Oxford: OUP, 2004). Revd Dr John Binns is a Visiting Professor of the Institute and Vicar of Great St Mary’s the University Church Cambridge. He is an Anglican priest with a long commitment to building understanding between churches of east and west. 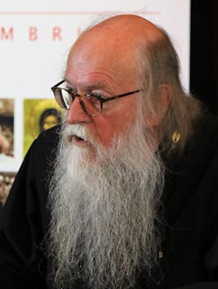 He studied at the Serbian Orthodox Theological Faculty at Belgrade (1972); and was awarded a PhD degree by Kings College London for his thesis on Cyril of Scythopolis (1986). He has been Chair of Trustees of the Fellowship of St Alban and St Sergius, and was a founding director of the Institute of Orthodox Christian Studies. His publications include Ascetics and Ambassadors of Christ, the Monasteries of Palestine 314-631 (OUP 1994) and An Introduction to the Christian Orthodox Churches (CUP 2002). As Visiting Professor he is initiating a research programme on Ethiopian Christianity. Revd Prof Nikolaos Loudovikos is a Visiting Professor of the Institute. Father Nikolaos is President of the University Ecclesiastical Academy of Thessaloniki, for which he also teaches Systematic Theology, and a Honorary Research Fellow at the University of Winchester. In addition to his numerous scholarly publications, he is known through frequent contributions in newspapers and appearances in radio and television programmes. His most recent publications include ‘The strive for participation: Thomas Aquinas and Gregory Palamas’ (forthcoming); ‘A eucharistic ontology: Maximus The Confessor’s eschatological ontology of being as dialogical reciprocity’ (2010); ‘The terrors of the person and the ordeals of love: critical thoughts for a postmodern theological ontology’ (2009); ‘Theopoiia: postmodern theological aporia’ (2006); ‘Orthodoxy and modernization: Byzantine individualization, state and history in the perspective of the European future’ (2006). Revd Prof Andrew Louth is a Visiting Professor of IOCS. He is an Emeritus Professor of Patristic and Byzantine Studies with the Durham University. Father Andrew has also taught in Oxford University (patristics, and early Christian theology) and in Goldsmiths College in the University of London (Byzantine and early Medieval history). Father Andrew studied at the Universities of Cambridge and Edinburgh and taught courses on the history and theology of the Christian Church. Dr Marcus Plested, MA M.Phil D.Phil (Oxford) is a Visiting Professor of the Institute. He is currently an Associate Professor of Greek Patristic and Byzantine Theology at Marquette University, US. Dr Plested was schooled in London and went on to read Modern History followed by Theology at Merton College, Oxford. He took his doctorate from Oxford in 1999 with a thesis on the Macarian Homilies supervised by Bishop Kallistos (Ware). He has been at the Institute since 2000. Dr Plested has taught, lectured, and published widely in the field of Orthodox Christian studies. His most recent book is The Macarian Legacy: The Place of Macarius-Symeon in the Eastern Christian Tradition (Oxford: OUP 2004). Other research interests include the understanding of wisdom in the Christian tradition and the interaction between western and eastern theological traditions. He was received into the Orthodox Church in 1992. Revd Dr Liviu Barbu is an Associate Lecturer and Distance Learning Tutor at IOCS. Father Liviu teaches and supervises at postgraduate level in the fields of contemporary Orthodox Theology, Systematics, Practical and Pastoral Theology. He is an Orthodox priest, Rector of Martyr Philothea and Saint Bede Parish in Norwich. Father Liviu earned a PhD in Theology from King’s College London and has lectured and published on Pastoral Theology, in particular on spiritual direction and formation in the Eastern Orthodox tradition.